Wouldn’t it be great if it were easy? That’s what it said on the back of the cereal box. It said some other things too, but my eyes stopped right there. Wouldn’t it be great? Wouldn’t it be great if it were easy? I used my pocket knife to cut around the words, and then, to save the coupon printed on the inside of the box, I peeled it. Or at least I tried to until someone with fingers more dexterous than mine took it from me and stripped it like a piece of tape. The irony was not lost on me. It was hard just cutting those simple words out. So maybe the real lesson was something more like this: sometimes the things most worth doing are the hard things. Like forgiveness being born out of hard relationships. Like humility being born from hard struggles. Like perseverance being born out of fear. Think about it: When we have choices and no clear answer we learn patience. When we have too much to do and not enough time we learn acceptance. When we have to say good-bye we learn to keep going. When we are at the end of ourselves, we are most likely to look out and see God. What do you think about Jesus’ disciples? Do you think they had it easy? Have you ever really thought about what it would be like to follow the Son of Man who had no place to lay his head? Amazing, yes. Easy? Doubtful. And isn’t that the path we are also called to? Oh, we are in a different time and a different place to be sure. But God is calling each one of us to be remade in the image of Christ. That doesn’t sound easy to me. It sounds like there are a whole lot of hard things I need to learn. And relearn. And relearn again. Maybe the reality is like that song I heard while driving home the other day: the trials of this life may in fact be God’s blessings in disguise. Jesus said that His yoke is easy and his burden is light, but He also said the way is hard that leads to life. The truly easy path may in fact be the one that looks the most challenging right now. After all, Noah got to his rainbow only after going through the storm. Wouldn’t it be great if it were easy? Yes. But sometimes what we want and what we need are two very different things. Sometimes we get to the easy only by going through the hard. For the gate is narrow and the way is hard that leads to life, and those who find it are few… Take my yoke upon you and learn from me, for I am gentle and lowly in heart and you will find rest for your souls. For my yoke is easy and my burden is light (Matthew 7:13, 11:29-30). I had my concerns about this particular team building exercise when I saw hoola hoops and a rope and a small stuffed pig. But my concerns were quickly laid to rest. The rope was merely placed in a pile in the middle of the hoola hoop and we had to discuss, without reaching beyond the edge of the ring, whether pulling an end of the rope would produce a knot. I never did see what the pig was used for. At the conclusion of some introductory exercises, we embarked on the grand finale. Each person was given a picture that was part of a larger story board. Without showing our picture to anyone, we had to identify where in the larger story we fit and line up in order. With close to 50 people in the room, this was no small task. Conversations erupted as we began grouping ourselves into related clumps and growing our line. The story began to take shape until we were all in order and did our “big reveal,” turning the pictures around to see the whole story. There are several lessons that can be taken from this exercise. The importance of communication, the idea that we are all part of a larger story, the understanding that we all had to work together in order to see the big picture. But perhaps one of the strongest lessons for me was one of trust. We each had to trust that others in the line were doing their part. I could not be everyplace at once. I could not be filling in some other part of the story; I had to focus on my own part. This is a wonderful exercise for the office, and an even better one for the Church. Our lives are like those individual pictures, each part of a larger story. We will never see all the pieces in our lifetime, but our job is not to worry about all the pieces; it is to worry about our own. God has given each one of us a place in the body of Christ and a specific job to do (1 Corinthians 12). There may be things we don’t understand, but we have to remember that our perspective is only one tiny slice of the larger picture. We need to trust that God is orchestrating the big picture, even when we don’t see how our piece – or someone else’s – fits in. There are plenty of times things just plain don’t make sense from our perspective. That’s okay. Remember, it didn’t make sense to the disciples that Jesus was crucified. That didn’t fit into their picture of Israel’s Messiah at all. And yet Jesus’ death and subsequent resurrection have made it possible for all of us to be brought back into fellowship with God. God knew what He was doing, even if his disciples didn’t. All around us there are pieces of the larger picture that do not make sense to us, but we have God’s promise that He is still in control. Someday Jesus will return, and when we are joined with Him in heaven, there will be a “Big Reveal” unlike anything we can imagine now. We will suddenly see how God used our tiny little sliver as part of the larger picture. For I consider that the sufferings of this present time are not worth comparing with the glory that is to be revealed to us. For the creation waits with eager longing for the revealing of the sons of God (Romans 8:18-19). Take a moment and think about a trail. What comes to mind? I immediately think of a wooded hiking trail, but when I stop to think about it, that’s only one small facet of the term. There are a lot of note-worthy trails. In the United States alone there are trails shrouded in historical tragedy, like the Trail of Tears. Or trails commemorating pioneering challenges and triumphs, like the Oregon Trail. Or trails established to display the natural grandeur of our country, like the Appalachian Trail. And in the state of Indiana, there is a trail of…. Are you ready for this? Yes, Garfield. You know, that irascible and nap-loving cartoon creation of Jim Davis. Apparently Jim Davis was born in Indiana, and in commemoration there are, scattered throughout his home county, a dozen Garfield statues. The tourism bureau has put together a map so that easily entertained tourists like me can drive along the Trail of Garfields. Even better: there is a cell phone tour along the way. This got me thinking about trails. The fact is our path through life covers a lot of different trails. 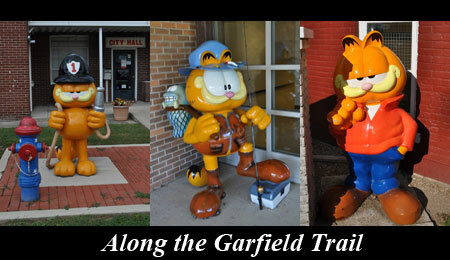 There are happy trails, scary trails, sad trails, fun trails, hard trails, easy trails, and yes, even Garfield trails. Trails can be both exciting and scary, and for the exact same reason; you never know what you might find. Some trails are clearly marked. Some trails are so elusive we might wonder if we’ve lost our way completely. But every trail we travel has one thing in common: We are not the first to travel it. The very definition of a trail indicates that someone went before us to mark it out. And the existence of a trail suggests a purpose. After all, no one puts forth the effort to create a trail to nowhere. The Trail of Life is no different. Our trail has both a purpose and a destination; it’s leading us ever closer to God. God himself marked out our trail, and He knows everything about it. He knows every twist and turn, every unforeseen adventure, and every peak and valley. He may allow us to be surprised by the circumstances of life, but He himself is never surprised. He has walked this trail already. He created this trail. Whatever section of life’s trail you may be travelling, know that you are not alone. The Creator of the universe Himself also created this trail you are walking. He will guide you through. He will guide you home. And a highway shall be there, and it shall be called the Way of Holiness; the unclean shall not pass over it. It shall belong to those who walk on the way; even if they are fools, they shall not go astray (Isaiah 35:8).